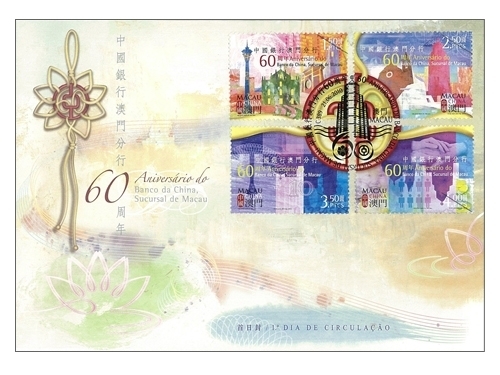 In celebration of the 60th anniversary of Bank of China Macau Branch, Macao Post will issue the stamp theme “60th Anniversary of Bank of China Macau Branch” on 21st June, 2010. 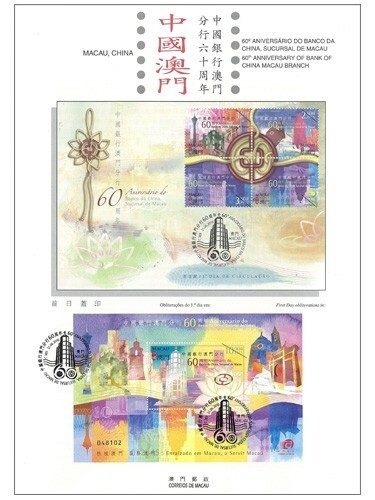 This issue includes a set of four stamps and a souvenir sheet. 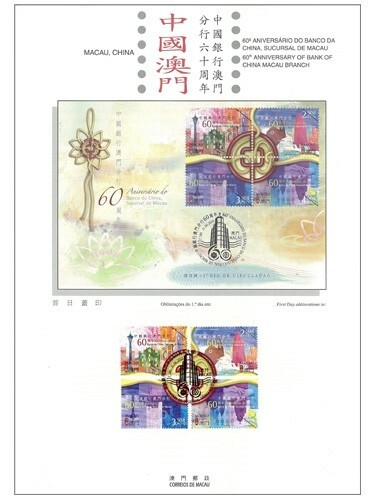 The design has woven together the emblem of Bank of China, the Lotus, Macao Heritage sites and also the true love knot, ribbon and number 60 etc. 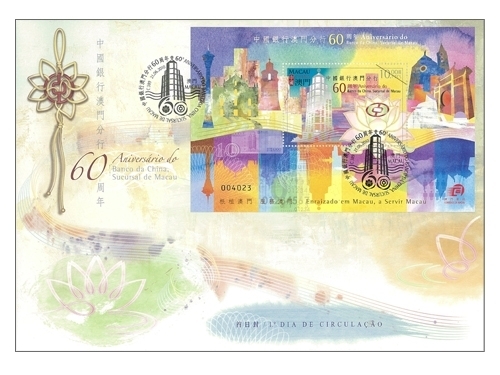 It implies the growth of the past 60 years of Bank of China Macau Branch as well as in the future, the desire to give back to Macao through good quality financial services. 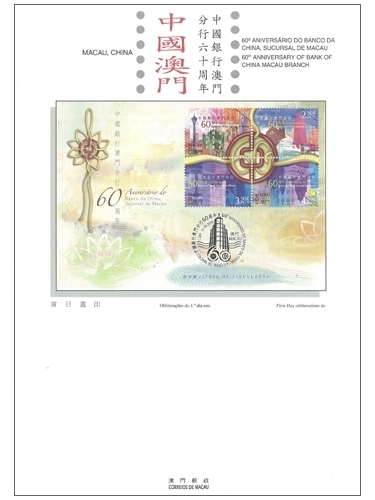 The stamp designer of this issue is Ms. Helena Man In, Ng, and the text for the information brochure is written by Bank of China Macau Branch. 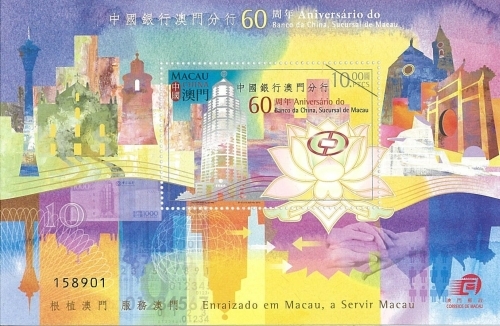 This is the fifth issue in 2010. 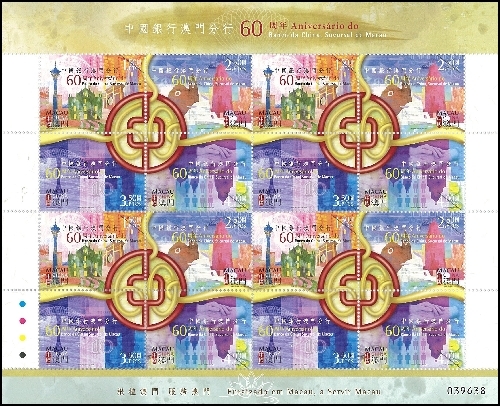 The previous issued stamps are “Lunar Year of the Tiger” on 02/01/2010, “I Ching, Pa Kua VII” on 01/03/2010, “Centenary of International Women’s Day” on 08/03/2010 and “EXPO 2010 SHANGHAI CHINA” on 01/05/2010. 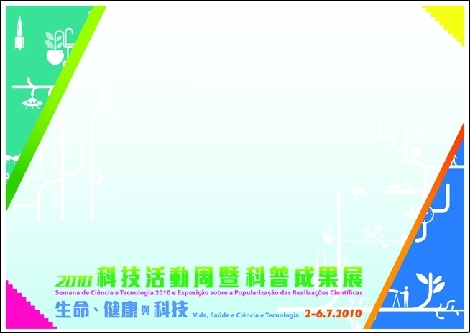 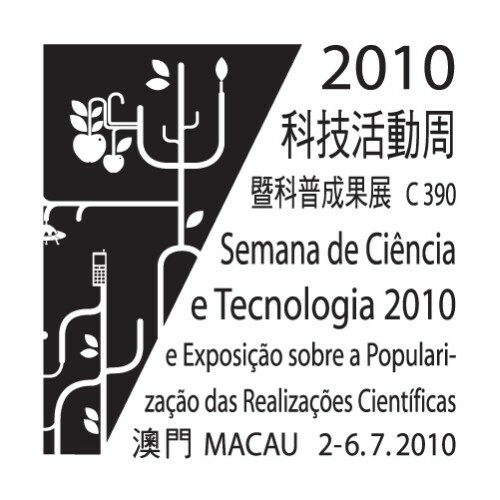 To celebrate the Science and Technology Week 2010, Macao Post announced that a Temporary Post Counter will be set up at our Philatelic Shop located at Main Hall of Macau Fisherman’s Wharf and Macao Post Headquarters during 2nd to 6th July 2010 providing the commemorative cancellation service for the “Science and Technology Week 2010”. 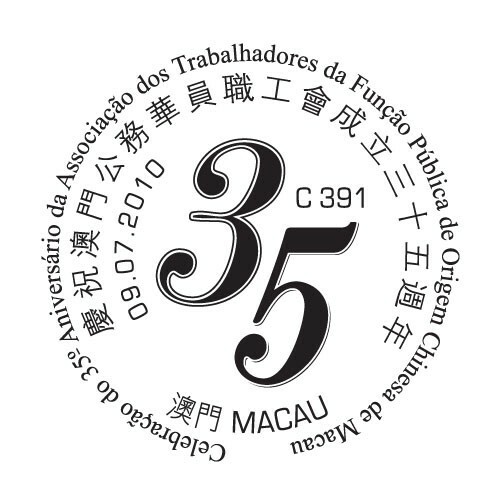 To celebrate the 35th Anniversary of the Macao Chinese Civil Servants’ Association, Macao Post announced that a Temporary Post Counter will be set up at the Philatelic Shop located at Macao Post Headquarters, from 9:00 to 17:30 on 9th July 2010 to provide the commemorative postmark cancellation service for the “Celebration of the 35th Anniversary of the Macao Chinese Civil Servants’ Association”. 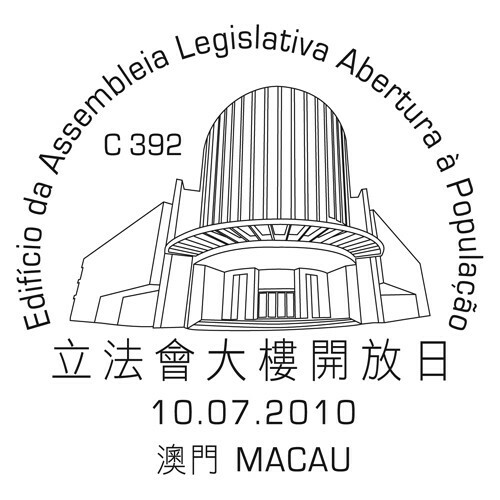 To celebrate the Legislative Assembly Building Open Day, Macao Post announces that a Temporary Post Counter will be set up at the Square of Legislative Assembly Building at 10:00 to 18:00 on 10th July 2010, providing the commemorative postmark cancellation service for the “Legislative Assembly Building Open Day”. 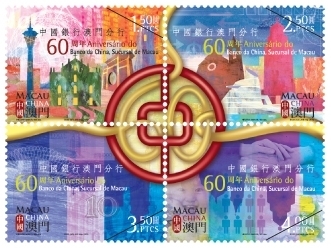 Macao Post announces that the issue date of the stamp issue "World Heritage – St. Augustine’s Square" will be changed from 30th July 2010 to 15th July 2010.